With a Back Injury Exercise With Caution! In some cases when you have a back injury exercise can be beneficial to work through the pain of the injury. In this video below I am demonstrating a couple of ways to heal a upper and lower back injury muscle sprain or strain. Following these tips can help you to overcome your back injury. 1. Injuries involving muscle sprains or strains, even herniated discs can be alleviated by icing to reduce pain and inflammation. 2. Once inflammation is under control it is important to restore circulation or blood flow back to the area to promote healing through gentle back exercises like the stretch below. 3. Exercise for back injuries can be accomplished with gentle stretches involving exhaling as you draw your knees toward the chest as shown above in the lower back stretch. This exercise helps to engage or strenthen the abdominal muscles simultaneously while you are stretching the muscles of the back. I have found Pilates exercises to be most beneficial for people who have and are prone to back injuries. 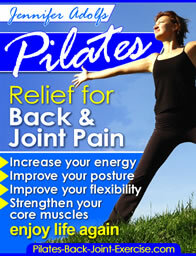 This is one of the reasons I developed the new Pilates Ebook: Relief from Back and Joint Pain. If you have a back injury that involves upper back pain or injury follow these tips to help alleviate the back pain. A good way to stretch the upper back and shoulders is as shown above. Using a table or counter top cross your hands over each other. Step back a couple of feet and then hinge back from the waist why letting your head and chest sink down between your arms. Feel the shoulder blades stretch wide apart. If you have a back injury or are prone to it, exercises to prevent and alleviate the symptoms should be of utmost priority for you. Following a regular and consistent exercise routine involving stretching and strengthening the back and core musculature is the best place for you to start. Leave back injury exercise and find out more about how to care for you back using Pilates exercises.